Hello! The other day, I had a huge craving for cookie dough so, as always, I trawled through a load of baking sites and ended up making these pieces of joy. 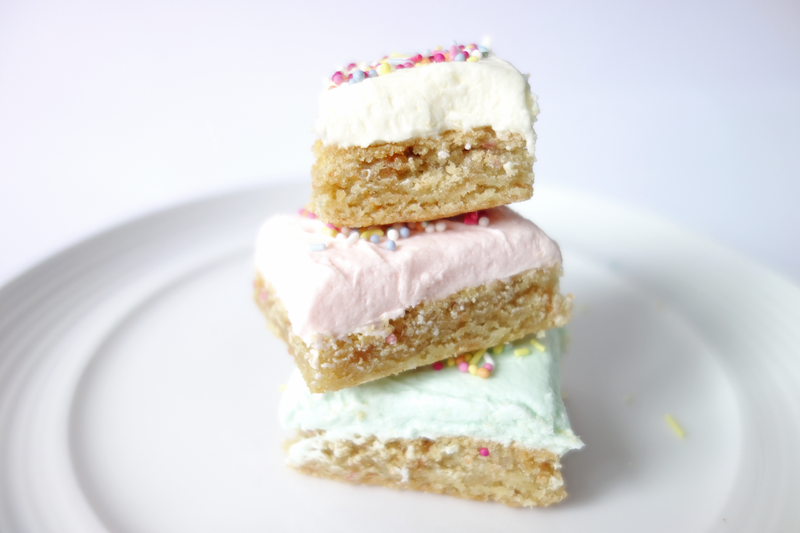 You bake them like a huge slab, cover it in frosting the cut into chunks – perfect as little bitesized treats! They’re so unbelievably easy to make too and all of the ingredients should already be in your cupboard, so read on for some delicious gooey cookie goodness. Food colouring – I divided it into three, but you could do all one colour or none at all. Step Two | Soften the butter for about one minute using a handheld mixer or standing mixer with paddle attachment. When it’s smooth, add in the sugar until it’s light and fluffy. Then mix the egg, egg yolk and vanilla extract until completely incorporated. Step Three | In another bowl, mix together the flour, salt, baking powder, bicarbonate soda and cornstarch. With the mixer already running, add the dry ingredients to the wet ingredients in stages. The dough should be quite thick. Once combined, add the sprinkles (as in the original recipe) but make sure they’re quite large, as hundreds and thousands disappeared once baked! Step Four | Pour the mix into your baking tray, making sure it’s even. Bake for 25-26 minutes until lightly browned, they should be really chewy looking. Allow to cool completely, the middle may sink slightly but that’s normal! Step Five (for the frosting) | Mix the icing sugar and butter together until creamy, then add the milk and vanilla extract and mix on a high speed to make a really light frosting. The longer you mix the lighter it will be! If you’re doing three colours, separate the icing into three bowls, add the desired colour to each and mix until it’s the colour you want. 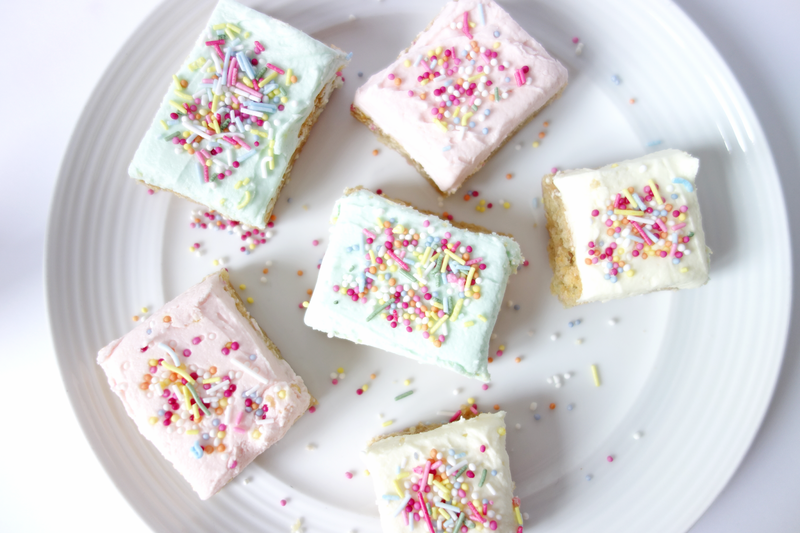 Step Six | Cut the cookie bar into three (or leave whole if you’re just using one colour) and spread the frosting evenly, add sprinkles and cut into chunks. They go more doughy/chewy after a day but taste just as delicious straight from the pan. I promise you they taste amazing and would be equally as nice with chocolate chips and plain frosting! It’s such a good staple recipe and well worth noting down for the future. 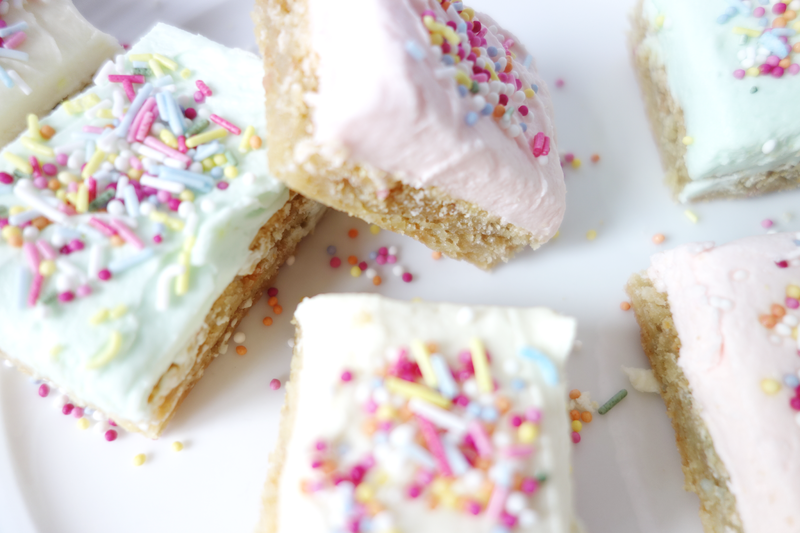 It takes around 5-10 minutes to add all the ingredients together and 25mins to bake, including time to add the frosting it takes around 45minutes for the whole thing which isn’t too bad at all for a little Sunday afternoon bake. Hope you enjoy!